WILDROSE IRISH SPRING CODY - "CODY"
Cody recently underwent the prcd Mutation test for PRA, and has received a Normal/Clear result from Optigen. This was great news for us, and all of Cody's pup's. Cody is the son of champions. In Cody's 56 dog pedigree includes 32 FTCh/FTW. There are 7 dogs with 11 International field trial awards. Cody is out of British Field Trial Champion (FTCh) Shortthorn Tommy of Leadburn. "Tommy" is considered to be the most qualified yellow British FTCh outside the United Kingdom. In fact at the time of breeding, Cody's sire was the only British Field Trial Champion yellow in North America. In fact, the only higher titled yellow dog in the U.K. is Cody's Grandsire, FTCh Dargdaffin Dynamo, who holds 4 Championship qualifications. Cody is definitely his father's son. Like his father, his confirmation is excellent, with a very attractive square head, broad chest, and extremely muscular feature's, making him an excellent representation of a properly bred British lab. Cody's mom, Raughlin Chris of Astraglen "Chris" was imported in 2002 is out of FTCh Baildonian Baron of Craighorn "Baron". Baron is the highest qualified British FTCh to live outside the United Kingdom. 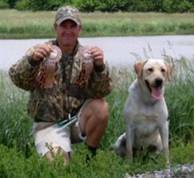 He received 3rd at the 1997 British Retriever Championship. 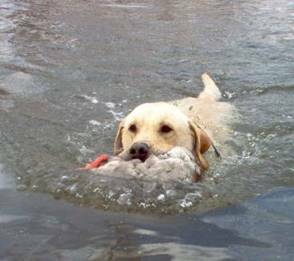 Chris' Grandsire, FTCh Theoweir Turramurra Teal, won the 1995 Irish Retriever Championship. Cody is a very clean dog, with a nice thick coat, and the classic "otter tail". His weight is 64 lbs. 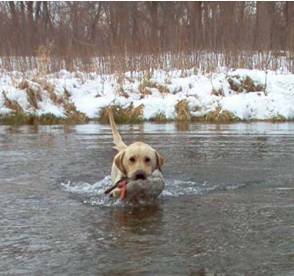 Cody's drive is as hard on blinds, as it is on marks, over land or water. Yet, you put him in the truck, or home, and your liable to forget he's there, do to his extremely quiet, calm temperament. A perfect combination. Making him a great companion in the field, and in the home. Cody is an excellent game finder, and problem solver. This latest characteristic is most impressive to see. The training he has received, has not overpowered his ability to think, and react on his own. This is not common in American breed, and trained dogs today. Cody is available for stud services to approved dams.